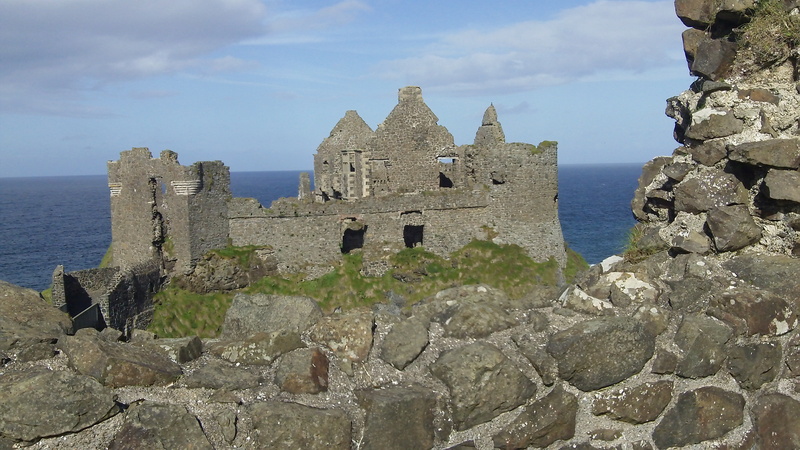 The ruins of Dunluce Castle stand on a high cliff and are open to the sea wind, which sweeps through them. Ninety feet below is Mermaid Cave. Yellow marigolds dot the green grass on top of the cliff. Wrapped in history and legends, the castle walls saw love and death, treachery and courage, lavish parties and violent assaults before they fell into neglect. 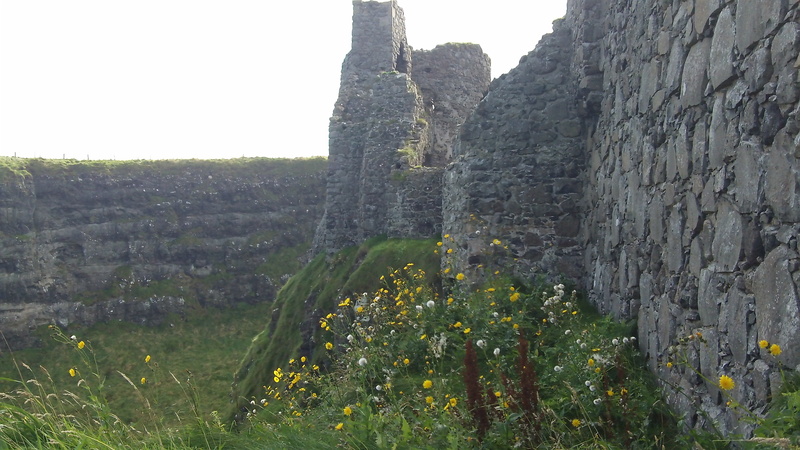 The history of the area in which Dunluce Castle stands dates back to the 13th century. It was linked to Richard de Burgh, the 2nd Earl of Ulster, and to his cousins, the De Mandevilles. The MacQuillans were the first documented owners of Dunluce Castle. They built the castle in the beginning of the 1500s. They are believed to have arrived in Ireland as mercenaries in 1200. However there are no proven records of this. They bought the area in which Dunluce Castle stands from the De Mandevilles. They also gave this area its name, the Route, which means a private army. The MacQuillans were constantly feuding with other prominent Irish clans, such as the O’Cahans. There is a legend about Lord MacQuillan’s only daughter, young and beautiful Maeve. 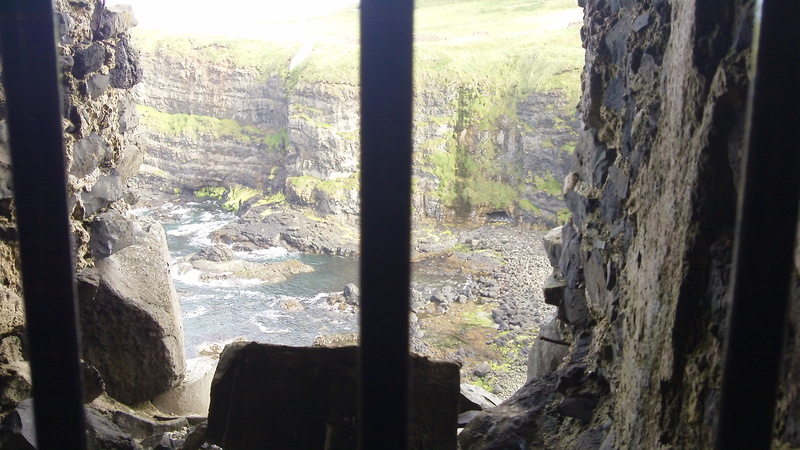 She fell in love with Reginald O’Cahan, who was held as a prisoner in Dunluce Castle. Lord MacQuillan, when he noticed his daughter’s affection for Reginald O’Cahan, decided to arrange a marriage between his daughter and Rory Oge, his kinsman. Maeve declined and was locked in a tower. Her beloved Reginald O’Cahan arranged an escape. He hid a boat in Mermaid Cave and waited for her. One stormy night Maeve managed to get out of the tower. She and Reginald tried to row the boat to Portrush. However, the storm was so strong that their boat was crushed against the cliffs. Her body was never recovered. In the middle of the 1500s, the MacDonnells captured the Route. They were another prominent clan and were once allies of the MacQuillans. 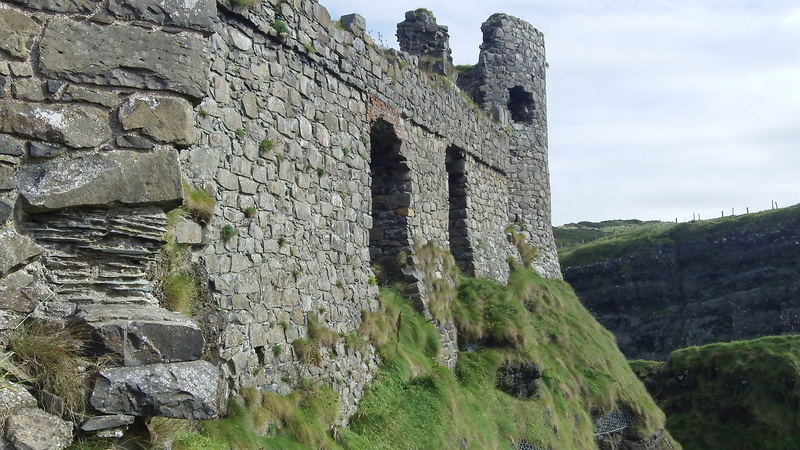 After a few bloody battles Sorley Boy MacDonnell drove the MacQuillans from the Route and took possession of Dunluce Castle. Subsequently there were years of struggle between the MacDonnells, the English crown and the O’Neills, another powerful Irish clan. In 1575, Queen Elizabeth I sent the Lord Deputy Essex to Ireland. She wanted Sorley Boy to accept conditions laid down by her. Since Sorely Boy continued to disregard these conditions, the Lord Deputy Essex ordered Sir Francis Drake and another commander to attack the clan of MacDonnells and their supporters, who were hiding on Rathlin Island. Sir Francis Drake’s troops murdered over 400 men, women, and children on Rathlin Island. Sorley Boy witnessed this massacre from the mainland. In retaliation he captured Carrickfergus and partly regained power over the Glens and the Route. Later, Queen Elizabeth I became alarmed by the growing power of the MacDonnells and sent Sir John Perrot, the Lord Deputy of Ireland to eliminate the threat. 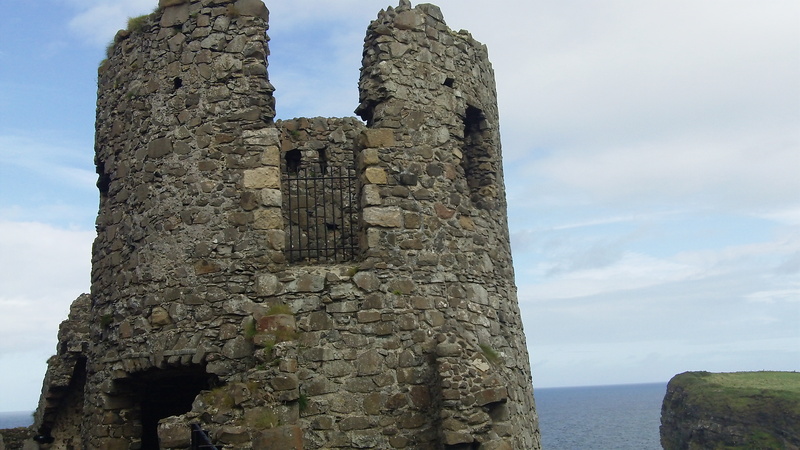 He besieged and took Dunluce Castle. Subsequently, Sorley Boy retook Dunluce Castle. 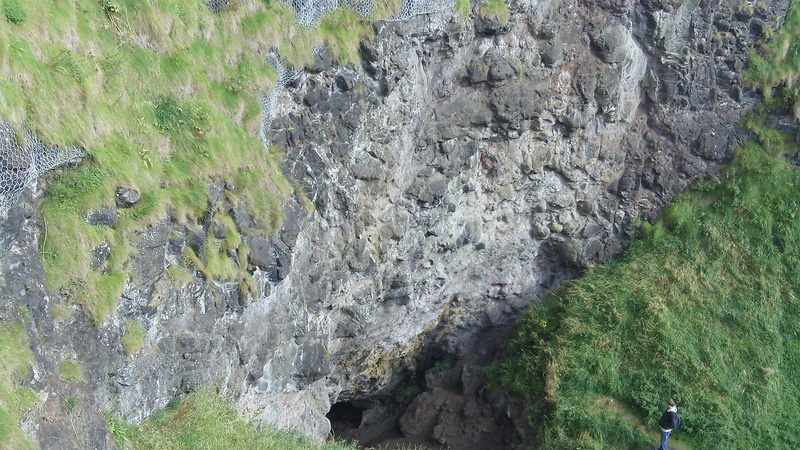 He is said to have climbed the cliff of Dunluce Castle with his kinsmen and to have killed the English captain in command. However, in order to get back his lordship of the Glens and the Route, Sorley Boy had to pledge allegiance to the Queen. He went to Dublin Castle and pledged his loyalty by kneeling in front of a portrait of Queen Elizabeth I. He regained his legal rights to his estate, but then, on his way home, he was taken to see his son’s Alexander head nailed above the gates of Dublin Castle. Finally, Sorley Boy settled peacefully in Dunluce Castle. 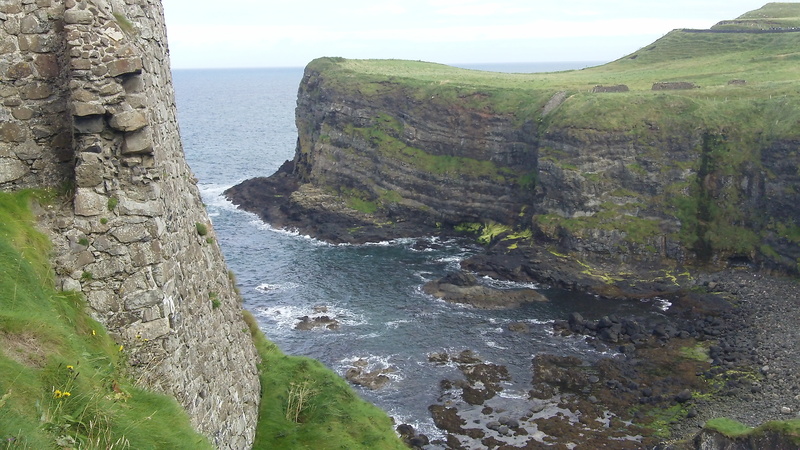 When the Spanish battleship La Girona was shipwrecked close to Dunluce Castle, he managed to recover two cannons and install them in the South-east tower of the castle. It is rumored that he also salvaged two chests filled with treasure and helped a few survivors from La Girona escape from Ireland. In 1601 Randal MacDonnell, Sorley Boy’s son, led his men to join Hugh O’Neill in a rebellion against the English crown. At the battle of Kinsale their forces were defeated. MacDonnell surrendered to the English and was pardoned. 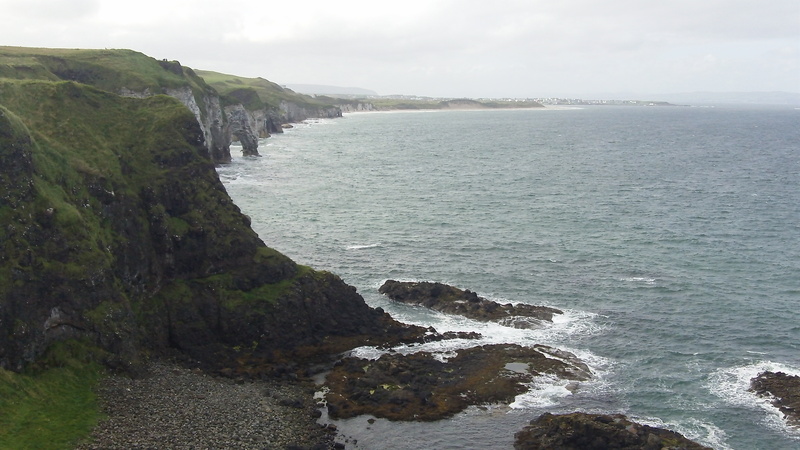 King James VI granted him the territories of the Route and the Antrim coast. 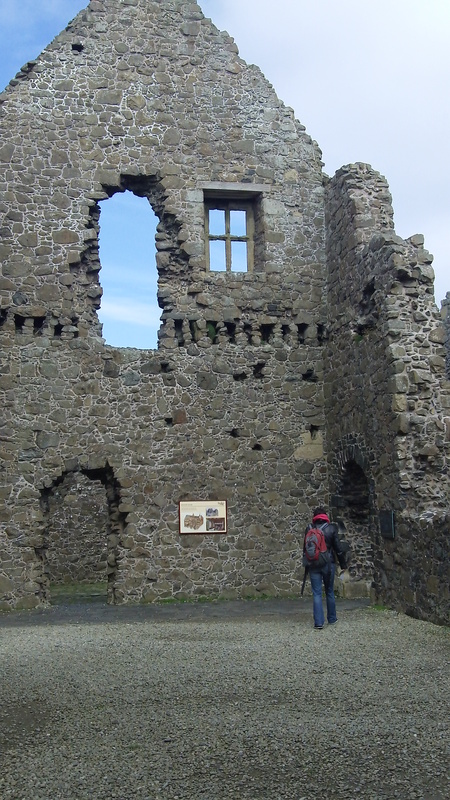 Randal MacDonnell built a town next to Dunluce Castle in 1608. He also brought new settlers from Scotland. The streets in the town were carefully planned and laid out with cobble stones. Houses with indoor plumbing and administrative buildings were constructed. By 1620 Randal MacDonnell became the Earl of Antrim and his large estate was thriving. After his death his son Randal became the 2nd Earl of Antrim. He married Catherine Manners, a wealthy widow. They enjoyed a lavish life style, inviting guests from the local gentry to their feasts. The castle was richly furnished with chairs upholstered in silk and decorated with Persian carpets. Randal was arrested in 1642 by General Munro, following the Irish Rebellion. When Cromwell came to power, Dunluce Castle and the town were occupied by the soldiers of the Cromwellian army. Randal regained his estates in 1665, when Charles II was restored as the king of England. Dunluce Castle was the seat of the Earl of Antrim until 1690, when the Battle of the Boyne took place. After this battle the MacDonnells moved to Glenarm Castle, which remains the family seat to this day. Dunluce Castle gradually fell into ruins. Now the castle is in the guardianship of the Northern Ireland Environmental Agency. Dunluce Church, across the main road, was originally founded in the 13th century as St. Cuthbert’s Church. It was maintained and refurbished by the MacDonnells. Citizens of Dunluce town were buried in the graveyard. Dunluce Castle was featured in the “Game of Thrones” as the stronghold of the Lord Reaper of Pyke and the seat of the House of Greyjoy on the Iron Island.